A work by master forger, Han van Meergren, c 1925. 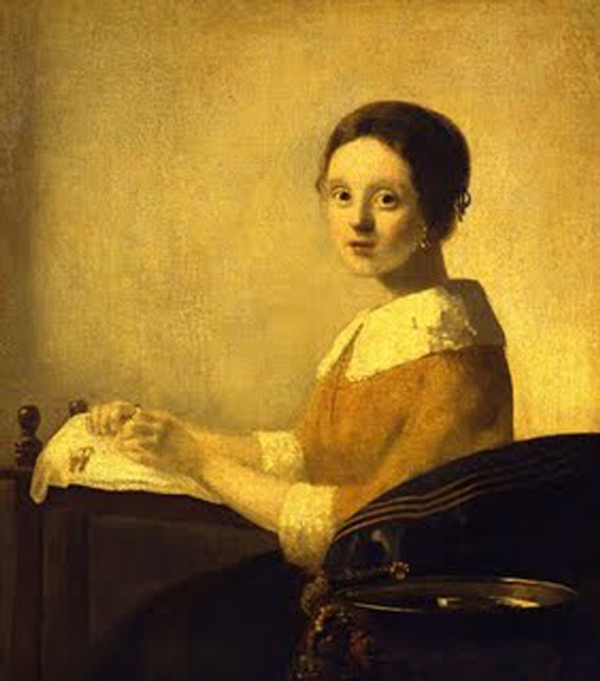 It proports to be a lost Vermeer painting of a lacemaker which was sold in 1816 and never seen again. The ‘rediscovered’ painting was sold to art dealer Joseph Duveen around 1928. Duveen sold it on to Andrew Mellon, who donated it to the Washington National Gallery of Art where it remains today. The original price for this forgery was over one million in today’s currency. We only know of 35 works by Vermeer, so the sudden appearance of an unknown original would be a major event. This can only invite deceit, and Han van Meergren (1889-1947) is prime on the list of suspects as the artist who produced this work. The Lace Maker was painted ~1925, and might have been a legitimate attempt by van Meergren at interpreting Vermeer’s style, since he produced number of paintings ‘in the style’ of masters like Frans Hals around that time. But his works were so good that they quickly found their way into the legitimate art market eager for a new discovery. A particularly scathing review pointing out the lack of originality in his own work apparently set him on the path to serious forgery. He used authentic 17th century canvas and duplicated paints from contemporary ingredients and formulas. Paintings would be baked upon completion to set the paint, then rolled to increase cracking. Through the years his works started to sell as originals, earning him around $25-30 million in today’s currency. One of them, “Christ with the Adulteress” ended up in the collection of Herman Göring, and was discovered along with other paintings looted by the Nazis after the war. In the process of trying to prove a Vermeer provenance, the painting was traced back to van Meergren, and he was arrested as a Nazi collaborator. He was tried in Amsterdam, the charge didn’t stick, but he was sentenced to one year for forgery. It was time never served, since he died shortly after the sentence was issued. The primary criticism of van Meergren’s Lace Maker is that she looks far too modern. This is not the daughter of the new Dutch merchant class of the 17th century intent on her lace. It looks more like someone who wants to get up and dance. This entry was posted in Fine Art in Historic Works. Bookmark the permalink. Is there prints to this picture ? Because I just purchase one just like it with the National Gallery of Art Washington DC on the back? Just Curious? The work is in the National Gallery of Art in Washington, so they would be the ones to contact if you want prints. It is not on display, so might not be a high priority for printing. I recently purchased one with a catalog number a National Gallery Art In Washington.. Could it be the original.